In many ways, Paris in the summertime is the least Parisian of times in the city of lights. Since French people generally have several weeks of paid vacation a year, huge numbers of locals flee town for vacations in the south of France or elsewhere, and the influx of visitors turns the city into a perpetual Babel, with foreign languages heard just as frequently as French in metro cars or cafes. The pace slows, the streets are calmer, the nights longer, and summer festivals and special events promise some fun days and nights out in the warm open air. You can expect most summer days in Paris to be anywhere between mild to very hot, with conditions ranging from clear to muggy, stormy and wet. In fact, this is one of the rainiest seasons of the year. And while the maximum high temperatures for June through August average out to about 75F, major heat waves have struck the city in recent years. Be prepared for much hotter days, especially in late July August and early September. Because summer in the capital is well-known for its muggy storms and showers, It's always a good idea to bring a practical combination of both "traditional" summer clothing (skirts, shorts, t-shirts, dresses and open-toed shoes) and outfits suitable for wet, rainy and windy conditions. Pack a good umbrella and don't forget the closed-toe shoes and raincoat-- unless you're willing to get a soaking. Consider bringing a water bottle or insulated thermos with you to hydrate adequately on especially hot days. Muggy conditions coupled with higher annual temperatures in recent years means it's crucial to avoid dehydration and heatstroke. You may even want to bring a parasol, especially if you're with young children who need extra protection from intense heat. Not to worry: it's recently become rather chic to sport one. Summer might not be ideal for all of you, but for some, it'll strike all the right chords. It's a prime time for festivals and great open-air events, and many of these, including the Paris Street Music Festival (Fete de la Musique), or the open-air cinema at the Villette park in the city's north, are entirely free. So are fun events like Paris Gay Pride and Bastille Day. Music fans will love Rock en Seine, a 3-day rock festival on the western outskirts of the city. The atmosphere is relaxed and carefree, and opportunities for great nightlife in Paris abound. 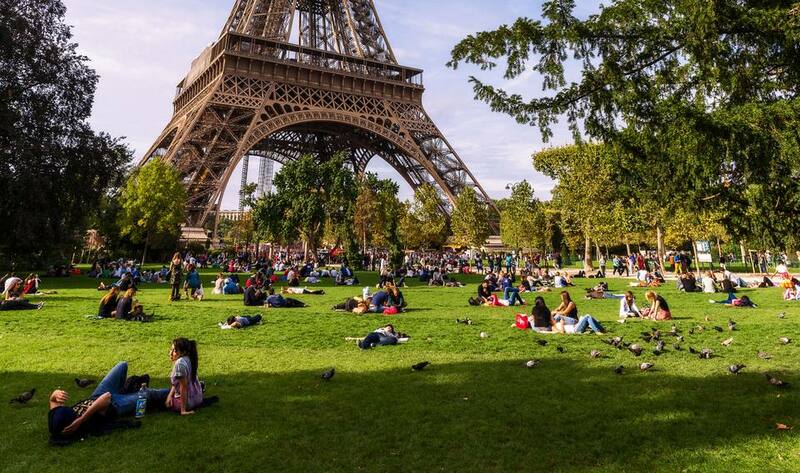 Sprawl out and have a picnic at one of Paris's elegant parks and gardens or along the banks of the Seine or have an all-nighter by hopping between some great Parisian nightclubs. To cool off, consider taking a boat tour of the Seine river, or jumping into plunge pools at Paris Plage, the annual pop-up beach operation that takes place through much of July and August. Before heading to the capital for a summery sojourn, keep the following tips and precautions in mind. It can be prohibitively expensive: A spike in airfares during peak season means reserving well ahead is a must (Look for a travel package and book direct via TripAdvisor). If you're taking the train, book tickets well ahead. It's not for the crowd-shy: Tourism peaks between May and early October most years in Paris, so you're going to have to accept having...erm, lots of company during your visits to Notre Dame Cathedral or the Eiffel Tower. The metro is generally crowded, and often, hot and congested, so make sure to wear layers even if it's relatively cool out. The weather can be erratic and unpredictable: Spells of rain or intense heat waves can ruin plans for outdoor activities, and extreme heat can be dangerous for elderly or young visitors. Make sure to bring lots of water with you on long excursions, and dress appropriately. Get more details about specific weather conditions in June, July and August. Visitors rule the city during the summer. Paris is always geared toward tourists, who flock here in the millions year-round. But in the summer, since most Parisians are gone, you can truly enjoy the city on your own terms. Meeting people from around the world is another fun prospect, especially for student travelers who may be using the summer break to explore the city.